Today’s post is a big ol’ teaser, and possibly an envy-inducer (wait ’til the end for the envy). I’m testing for Joni Marie Newman‘s new book, which is not just another cookbook. Instead, she’s including recipes and crafts for homemade gifts, edible treats, and all sorts of DIY awesomeness. It’s totally my thing, so I’m really excited to be helping out! 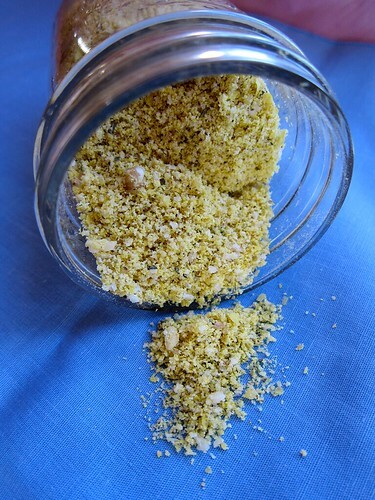 This weekend I tried my first tester recipe: Italian-spiced parmesan-esque sprinkles. Don’t they look grand? These are the first homemade cheese-y sprinkles I’ve ever made, so I don’t technically have a point of comparison, but these are just great! They’re nicely spiced with just the right amount of nutritional yeast-y flavor. So far, I’ve just eaten them plain (c’mon, I had to try a tiny spoonful!) and sprinkled atop macaroni & cheese (post to come! ), but I’ll find something more creative to do with them later. Something Italian-inspired, perhaps? …speaking of Italy, guess what? I’m going to Florence in five short days! I’m spending a week there with my best friend, who’s currently in Florence finishing up her MA. This won’t be my first time in the city (I visited with my family two summers ago), so I’m looking forward to just spending time hanging out and seeing less tourist-y places, since I’ve already done all those. However, I’ve never been in Florence as a vegan, so I’m excited to see what I can find to eat! Let me know if you’ve been there as a vegan and have any suggestions! What should I make with my parm-y sprinkles? Have you been to Italy? Where should I eat in Florence?! Hey there just wanted to let you know that I nominated you for an award that has been going about. I really like your blog and think you deserve a shout out!